Gold began July on weak footing, falling Monday to the lowest level since mid-May as a rebound of the dollar and European stock markets weakened demand for safe havens. August gold on Comex dropped as much as 0.8% to $1,231.90 an ounce in early US trading. The contract settled Friday at $1,242.30, leaving it down around 2.6% for the month of June, the precious metal first monthly decline of the year. Speculation that global central banks may soon raise interest rates has also been weighing on bullion, which last month broke its best winning streak since 2010. 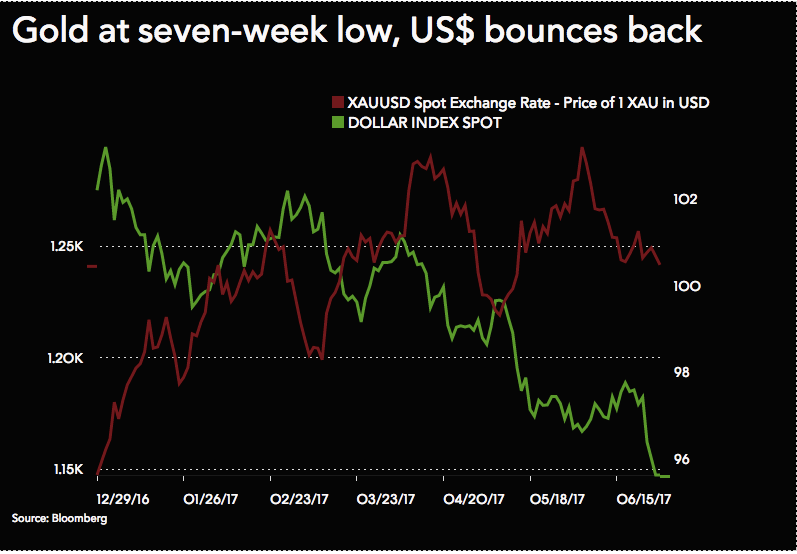 "The safe-haven buying that had pushed gold to an eight-month high earlier [last] month has slowly petered out, with risk-appetite improving in recent days," according to a note from Australia's ANZ Bank. Silver was also down Monday, trading 1.3% down to $16.415 an ounce.